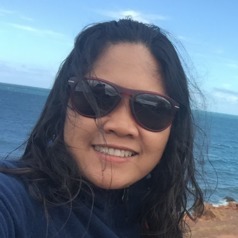 Dr Putu Liza Kusuma Mustika (Icha) obtained her PhD from James Cook University in Australia in December 2011 and was awarded the title in April 2012. Her PhD was on the sustainability of dolphin watching tourism in Bali, Indonesia. From July 2011 to December 2012 she worked with Conservation International Indonesia in Bali. Ever since, she has been doing her own works with her colleagues on sustainable tourism, cetacean watching tourism, marine mammal by-catch, marine mammal protected areas and the management of stranded marine mammals. Her collaborators are mostly based in Indonesia, Asia and Australia, as well as United Kingdom and the United States. Icha is active in assisting the Indonesian government in fostering the management of marine mammals, particularly whales and dolphins, in the Archipelago. She is currently the database coordinator for the whale stranding initiative in Indonesia, as well as leading a marine mammal-focused NGO in Indonesia (‘CETASI’ – Cetacean Sirenian Indonesia). Her interest research is in sustainable tourism, wildlife tourism, marine mammal population and marine mammal protected area.